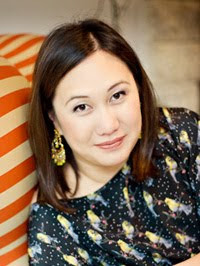 The Compulsive Reader: Interview with Melissa de la Cruz! Melissa de la Cruz, bestselling author of the Blue Bloods series, was kind enough to take a few moments out of her busy schedule to answer a few of my questions. TCR: There are a lot of changes in The Van Alen Legacy; what was the hardest part about writing the fourth book? The easiest? Melissa de la Cruz: The hardest part was Mimi's story, it was a slog through the Brazilian jungle for me as well! There's one sentence in her story: "It was a map" that took me about three rewrites and fifty pages to figure out WHAT was in that letter---fifty pages to get to THREE WORDS. I had pages and pages of crazy ways to get them to that cottage in the woods, and then Eureka! I could just say there was a map and there you go. You know when they say "trust the process"? Those people have never written fifty pages only to get to THREE WORDS. I still can't believe I had to write so much to get there. The easiest was Bliss's story, it was a lot of fun to imagine what life would be like with someone in your head – the Visitor—and how to describe that – I really liked my idea of 'sitting in the backseat' although she 'owns the car.' Her chapters were easy to write. Keys to the Repository contains a lot of fun details about the characters' childhoods and is an easy way to get back into the mythology and the story so far. I wrote a story about Jack and Sky's first meeting at the secret apartment, which is very romantic and was a lot of fun to write. Have you read anything good lately you'd like to recommend to your readers? I loved Cormac McCarthy's The Road, you just tear through it and it's like this crazy intense experience. For lighter reading, I loved Elizabeth Scott's Perfect You and Love You Hate You Miss You. Also Frank Portmann's King Dork is amazing. Anyone who follows your blog or Twitter feed knows you are quite stylish. What are some fall/winter fashions you are loving? I love the denim legging and the knee-high boot. You can wear it together! Although I tend to wear my knee-high boots with tights or black leggings – I like a monochromatic look – elongates the leg! 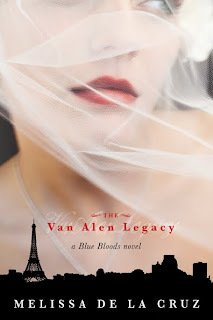 Be sure to pick up a copy The Van Alen Legacy, out now! A story about Jack and Schuylers secret meeting in the apartment?!?! OOOhhhh, I can't wait to read that!! Blue Bloods is one of my favorite series. I am so excited for Melissa and all the books she has planned to come out within the next few years! They're gonna be awesome. Ah...the 'denim legging.' Why not just call it what it is: a jegging. Oh, I kid you not - I heard the term from a fashion blogger. Eeeek! she has planned to come out within the next few years! They're gonna be awesome.